See also: Airplane, First Flight of; Wright Brothers in North Carolina. On 2 Mar. 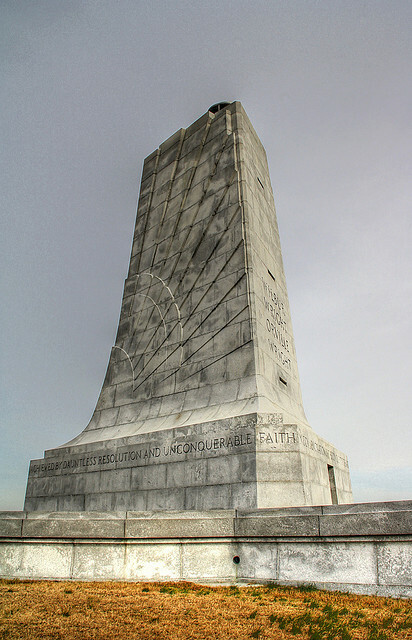 1927 Congress authorized the establishment of the Kill Devil Hills Monument National Memorial to commemorate Orville and Wilbur Wright's achievement of the first successful flights of a power-driven, heavier-than-air machine. The area, 428 acres located in Dare County off U.S. 158, was transferred from the War Department to the National Park Service on 10 Aug. 1933. In December 1953 its name was changed to the Wright Brothers National Memorial. The actual Wright Brothers Memorial sits atop Kill Devil Hill. Dedicated in 1932, the memorial is a triangular pylon 60 feet high made of gray granite from Mount Airy. Its sides are ornamented with outspread wings in bas-relief, giving the impression of a gigantic bird about to take flight. Stairs lead to the top of the shaft, and an observation platform offers a splendid view of the surrounding area, including dunes and Albemarle Sound. The monument's inscription reads: "In commemoration of the conquest of the air by the brothers Wilbur and Orville Wright conceived by Genius, achieved by Dauntless Resolution and Unconquerable Faith." Although the memorial is a unit of the National Park Service, the North Carolina Department of Cultural Resources manages the First Flight Centennial Commission. Both the National Park Service and the commission actively prepared for the activities that culminated in the one-hundredth anniversary of the Wright brothers' flight in December 2003. Wright Brothers National Memorial official website: http://www.nps.gov/wrbr/index.htm. Wright Brothers National Memorial Visitor Center official website: http://tps.cr.nps.gov/nhl/detail.cfm?ResourceId=27527013&ResourceType=Building. Wright, Hamilton M. "Chaining a Mountain of Sand," Popular Mechanics Monthly, July 1930, pp 99-98. "Wright brothers take flight in sculpture," USA Today. December 13, 2003. http://www.usatoday.com/news/nation/2003-12-13-wright-bros-sculpture_x.htm (accessed May 29, 2012). "Wright Brother's Memorial 2." (January 16, 2010) by Flickr user Serithian. http://www.flickr.com/photos/serithian/4295701550/ (accessed May 29, 2012). Let me first say that I am dissipointed. On 10/13/2018 myself and 3 of my friends wanted to tour the memorial, we arrived at the memorial and pulled up to the ticket gate and was told it would be $10.00 apiece being we did not qualify for any discounts. So we paid our $40.00, we were never told that the museum was closed due to renovations. So basically we paid $40.00 to drive around the memorial. It would have been nice had the Park Ranger at the ticket office would have told us that they were doing the renovations and all we could do was basically ride around the memorial. It just would have been nice to be told this before hand so that we could have made our own discussion as to if we wanted to continue and pay $40.00 for nothing. Sad very sad.